Richard, Bobby and Sid try to save Galavant's life while Valencia and Hortencia prepare for battle. 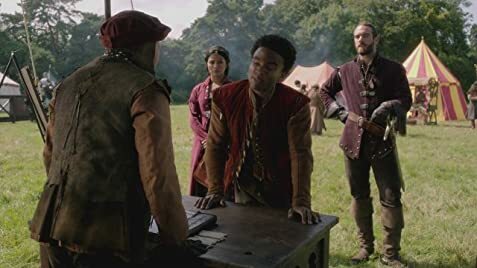 Galavant and the crew are shipwrecked thanks to bad advice, and their overland trek back to Richard's kingdom leads to a bar in West Hollow-wood then to a fortune teller. 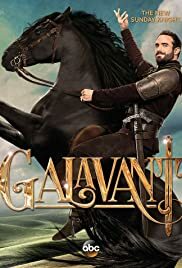 How many episodes of Galavant have you seen? So, I just finished the first two episodes. I did not feel like turning off the screen like others mentioned. It definitely won't be a show for everyone - Probably will be canceled, like so many others - But I will watch it until it isn't! I like the humor of the show. What can I say? Reminded me a bit of the Princess Bride's, if it were a musical ( am sorry if anyone feels offended by this) . I did like the last song of the second episode. I guess it's growing on me (also). In fact, I laughed out loud during several moments of the second episode, so I keep looking forward to the next one. Also, the actors are funny and charming. What the hell - Let's give it a shot, shall we?